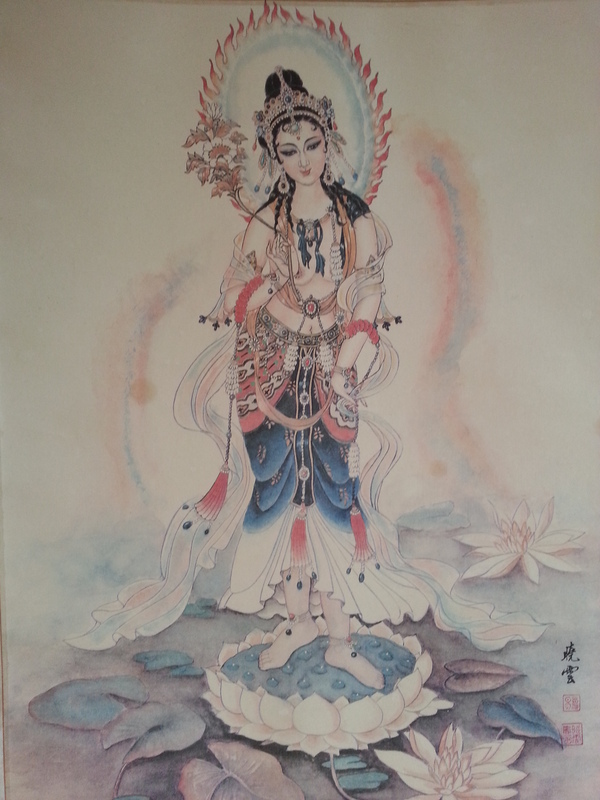 The Goddess Guānyīn. Guānyīn is a translation from the Sanskrit Avalokitasvara, a Mahāyāna bodhisattva. She is considered the personification of compassion and kindness, and a mother goddess. One winter while on a co-op work term in Toronto, these issues became debilitating to the point that I was sick almost all the time: missing work, unable to socialize, and feeling just plain miserable. Following the pattern set out for me when I was a child, I’d get sick, go to the doctor, be prescribed antibiotics, get somewhat better, only to get sicker than ever once the course of medication finished. This pattern repeated itself several times that winter, and finally I’d had enough. I began exploring herbal medicine and, a short time later, started seeing a naturopath. I was prescribed herbs and given acupuncture treatments. Finally, my health began to improve. Now, later in life, I’m experiencing challenges many women face: PMS, painful periods, peri-menopause, various muscoloskeletal pain patterns, headaches, stress, anxiety and occasional insomnia. treating women’s health on a holistic level: considering all the factors that contribute to issues like painful periods, PMS, and peri-menopausal, menopausal and post-menopausal conditions. treating headaches (and their close cousin “brain fog”) in their many manifestations: tension, sinus, hormonal — I believe it is important to provide relief from the symptoms, but also address the root causes as well. As I have also been teaching yoga since 2003, and in my own life have found yoga to be an invaluable ally to Chinese medicine in supporting and maintaining my health, I offer a customized yoga practice prescriptions that combine the strengths of the acupuncture and yoga. Your personalized practice will focus on yoga that is functional and therapeutic. In keeping with the holistic nature of Chinese medicine and yoga, the focus is on creating physical, mental, emotional, and spiritual harmony. We will work with passive (yin) and active (yang) poses as well as movements that stabilize, strengthen, and foster resilience in the ligaments, joints and myofascial tissue. Please see yoga services for more details on my yoga offerings.